Some of our favorite chefs have been contributing fantastic holiday recipes and tips to our #FWCookbook with Instagram. Justin Cogley shared one live. Some of our favorite chefs have been contributing fantastic holiday recipes and tips to our #FWCookbook with Instagram. In a fun turn of events, we got to see Best New Chef 2013 Justin Cogley share a quick garnishing technique live yesterday when he stopped by the F&W Test Kitchen. 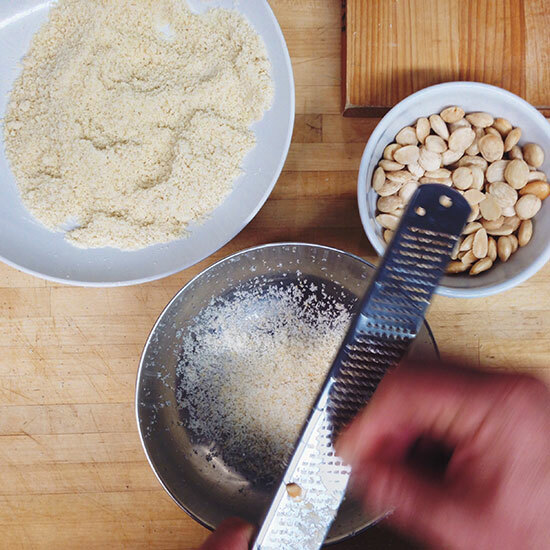 Cogley suggests toasting Marcona almonds and then grating them over roasted poultry or other dishes that could take a hit of nutty crunch, like casseroles. Another genius twist on his move? Candy the almonds first and microplane over dessert.